Officials at the signing ceremony held in Manama. 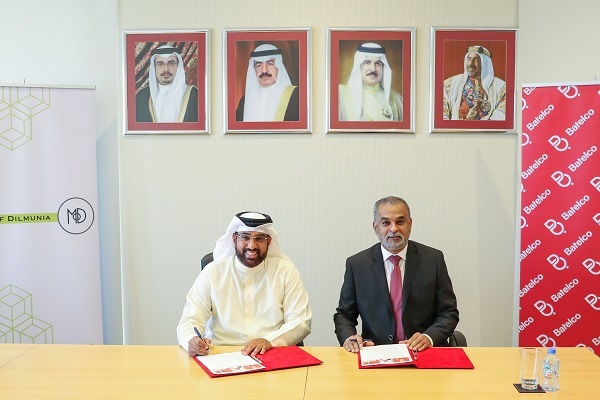 Batelco, the leading digital solutions provider in Bahrain, said it has signed a partnership deal with Dilmunia Mall Development Company for its unique family-centric retail and leisure destination, the Mall of Dilmunia. Under this agreement, Batelco will provide cutting-edge ICT solutions, including the most advanced network, digital solutions, security solutions, Wifi and mall management solutions to the upcoming mall, remarked Batelco Bahrain CEO Mohamed Bubashait after signing the deal with Dilmunia Mall Development Company Chairman Shaikh Khalid bin Mohamed Al Khalifa in the presence of officials from both companies. Bubashait said that Batelco was proud of this partnership, which was in line with its commitment to provide unmatched digital solutions, as well as its strategic mission to support the growth of various sectors and projects in the kingdom, which ultimately supports its national economy. “Over the years, Batelco has successfully established solid working relationships with a number of leading companies in the Kingdom and has always been and continues to be keen on providing the best products and services that meet customer expectations,” noted Bubashait. Batelco, he stated, has established a strong reputation as a local, regional and global telecom player due to the company’s ability to meet the requirements of the ICT sector, as well as position itself as the preferred ICT and digital solutions provider to a number of the kingdom’s major real estate development projects. On the tieup, Al Khalifa said: "We as the management of the mall have endeavored to provide solutions that meet the technological advancement in the market." The mall is a project by Dilmunia Mall Development Company that represents a balanced modernistic and futuristic architecture, which creates an exciting family oriented universe. The mall will provide fun and educational entertainment facilities for children and families.